HTC Obsession / Diamond 3 outed already? New WinMo phone on its way? 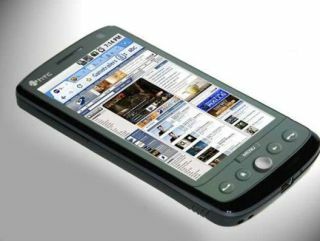 HTC - you remember that firm, the one that makes all those Android and Windows Mobile phones - looks likely to dip its toe into the smartphone water again with the Obsession. Likely to be the successor to the popular Touch Diamond 2, the new phone (which we've also heard could be called the Phenom) will apparently be running Windows Mobile 7 - although the delays to that OS mean it's unlikely HTC will wait that long to release the Obsession. Interestingly new pictures (well, more accurately, renders) of the phone have emerged, showing the device not running WinMo but Android - whether this means a dual launch or, more likely, a bored PhotoShopper. We'd also imagine that rather than Windows Mobile 7, it would be packing Maldives - or WinMo 6.6, likely to be announced at Mobile World Congress. But we're more excited about what the phone will pack specs-wise - we're looking at a pretty large screen, a Snapdragon 1GHz processor and HD video recording. We reckon when this phone does launch, possibly around June this year, the chassis with the five-button layout will be present - but if it's using Windows Mobile, don't expect to see HD video recording just yet.